Chevrolet is proud to offer a program to reward the men and women who serve as Firefighters, Police officers, EMT/Paramedic or 911 Dispatchers. Fill out the form below to learn more about the First Responder Discount at Cox Chevy! Must be a current Firefighter, Police, EMT/Paramedic or 911 Dispatcher. First Responders employed by federal, state or municipal governments may be subject to restrictions that limit their ability to accept this offer. Accordingly, this offer is void unless permitted by applicable federal, state and municipal laws, regulations, rules, ordinances, policies, codes of conduct, and other directives or standards regarding ethics and gift acceptance by state and municipal employees. Excludes select base trims. Not available with some other offers. Take new retail delivery by 1/2/19. See participating dealers for details. The Cox family has been at the dealership every day since 1926! Don’t hesitate to contact us directly! Internet Express Lane: if we can’t agree on the price or payments in an hour or less, dinner is on us. We offer complimentary maintenance on all new Chevrolet and used vehicle purchases! Our Trade-In Guarantee is simple: if you’re looking to sell your car, we’ll buy it, whether or not you make a purchase at our dealership. We’re truly available 24/7. 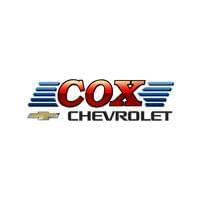 Cox Auto is open every day of the week, and we answer calls, texts, emails, and Facebook at any hour of the day. Test Drive at Your Convenience. Whether you’re at home or the office, Cox will bring any model to you for a test drive. Car shopping in the Sarasota area? Look no further than the new vehicle inventory at Cox Chevrolet. We have a wide variety of models in stock, from the popular Chevrolet Chevy Malibu to the fan favorite Chevy Silverado 1500. When you’re ready to take your Tampa commute to the next level, stop by Cox Chevrolet to pursue the Chevrolet models for sale in Bradenton, FL! Send us a number to text to you - we'll send a message from (941) 254-2840 to confirm the number / consent. $1,734 off MSRP! Priced below KBB Fair Purchase Price! This 2019 Chevrolet Spark LS in Red Hot is well equipped with: Emergency communication system, Exterior Parking Camera Rear, Premium audio system: Chevrolet MyLink. 30/38 City/Highway MPG Included 2 Year Complimentary Basic Maintenance / In Business Over 90 years / Call 1-888-844-3454 For Details. %Off Offer includes price reduction below MSRP and Cash Allowance. On Select 2019 Chevrolet Vehicles. Not available with special finance, lease or other offers. Take new retail delivery by 04/30/19. GMF Down Payment Assistance. Cash usable only if financed through a supported or unsupported GMF contract. NOT Compatible with Standalone APR Program. Customer must qualify and finance with GM Financial. See participating dealer for details. $3,095 off MSRP! Priced below KBB Fair Purchase Price! This 2019 Chevrolet Spark 1LT in Orange Burst Metallic is well equipped with: 15" Aluminum Wheels, Emergency communication system, Exterior Parking Camera Rear, Premium audio system: Chevrolet MyLink, Remote keyless entry, SiriusXM Radio. 30/38 City/Highway MPG Included 2 Year Complimentary Basic Maintenance / In Business Over 90 years / Call 1-888-844-3454 For Details. %Off Offer includes price reduction below MSRP and Cash Allowance. On Select 2019 Chevrolet Vehicles. Not available with special finance, lease or other offers. Take new retail delivery by 04/30/19. GMF Down Payment Assistance. Cash usable only if financed through a supported or unsupported GMF contract. NOT Compatible with Standalone APR Program. Customer must qualify and finance with GM Financial. See participating dealer for details. $2,866 off MSRP! Priced below KBB Fair Purchase Price! This 2019 Chevrolet Spark 1LT in Caribbean Blue Metallic is well equipped with: 15" Aluminum Wheels, Exterior Parking Camera Rear, Premium audio system: Chevrolet MyLink. 30/38 City/Highway MPG Included 2 Year Complimentary Basic Maintenance / In Business Over 90 years / Call 1-888-844-3454 For Details. %Off Offer includes price reduction below MSRP and Cash Allowance. On Select 2019 Chevrolet Vehicles. Not available with special finance, lease or other offers. Take new retail delivery by 04/30/19. GMF Down Payment Assistance. Cash usable only if financed through a supported or unsupported GMF contract. NOT Compatible with Standalone APR Program. Customer must qualify and finance with GM Financial. See participating dealer for details. $2,644 off MSRP! Priced below KBB Fair Purchase Price! This 2019 Chevrolet Spark ACTIV in Passion Fruit Metallic is well equipped with: AM/FM radio: SiriusXM, Exterior Parking Camera Rear, Front fog lights, Radio: Chevrolet Infotainment System w/AM/FM, SiriusXM Radio, Speed control. 30/37 City/Highway MPG Included 2 Year Complimentary Basic Maintenance / In Business Over 90 years / Call 1-888-844-3454 For Details. %Off Offer includes price reduction below MSRP and Cash Allowance. On Select 2019 Chevrolet Vehicles. Not available with special finance, lease or other offers. Take new retail delivery by 04/30/19. GMF Down Payment Assistance. Cash usable only if financed through a supported or unsupported GMF contract. NOT Compatible with Standalone APR Program. Customer must qualify and finance with GM Financial. See participating dealer for details. $3,494 off MSRP! Priced below KBB Fair Purchase Price! This 2019 Chevrolet Sonic LT in Kinetic Blue Metallic is well equipped with: 1.4L 4-Cylinder Turbocharged, 15" Aluminum Wheels, 2 USB Ports & Auxiliary Input Jack, Emergency communication system, Exterior Parking Camera Rear, SiriusXM Radio. 26/34 City/Highway MPG Included 2 Year Complimentary Basic Maintenance / In Business Over 90 years / Call 1-888-844-3454 For Details. %Off Offer includes price reduction below MSRP and Cash Allowance. On Select 2019 Chevrolet Vehicles. Not available with special finance, lease or other offers. Take new retail delivery by 04/30/19. GMF Down Payment Assistance. Cash usable only if financed through a supported or unsupported GMF contract. NOT Compatible with Standalone APR Program. Customer must qualify and finance with GM Financial. See participating dealer for details. $3,492 off MSRP! Priced below KBB Fair Purchase Price! This 2019 Chevrolet Cruze LS in Silver Ice Metallic is well equipped with: 1.4L 4-Cylinder Turbo DOHC CVVT, 2 Front USB Ports, Emergency communication system: OnStar and Chevrolet connected services capable, Exterior Parking Camera Rear, Illuminated entry, Radio: Chevrolet Infotainment 3 System. 28/38 City/Highway MPG Included 2 Year Complimentary Basic Maintenance / In Business Over 90 years / Call 1-888-844-3454 For Details. %Off Offer includes price reduction below MSRP and Cash Allowance. On Select 2019 Chevrolet Vehicles. Not available with special finance, lease or other offers. Take new retail delivery by 04/30/19. GMF Down Payment Assistance. Cash usable only if financed through a supported or unsupported GMF contract. NOT Compatible with Standalone APR Program. Customer must qualify and finance with GM Financial. See participating dealer for details. %Off Offer includes price reduction below MSRP and Cash Allowance. On Select 2019 Chevrolet Vehicles. Not available with special finance, lease or other offers. Take new retail delivery by 04/30/19. GMF Down Payment Assistance. Cash usable only if financed through a supported or unsupported GMF contract. NOT Compatible with Standalone APR Program. Customer must qualify and finance with GM Financial. See participating dealer for details. $3,492 off MSRP! Priced below KBB Fair Purchase Price! This 2019 Chevrolet Cruze LS in Summit White is well equipped with: 1.4L 4-Cylinder Turbo DOHC CVVT, 2 Front USB Ports, Emergency communication system: OnStar and Chevrolet connected services capable, Exterior Parking Camera Rear, Outside temperature display, Radio: Chevrolet Infotainment 3 System. 28/38 City/Highway MPG Included 2 Year Complimentary Basic Maintenance / In Business Over 90 years / Call 1-888-844-3454 For Details. %Off Offer includes price reduction below MSRP and Cash Allowance. On Select 2019 Chevrolet Vehicles. Not available with special finance, lease or other offers. Take new retail delivery by 04/30/19. GMF Down Payment Assistance. Cash usable only if financed through a supported or unsupported GMF contract. NOT Compatible with Standalone APR Program. Customer must qualify and finance with GM Financial. See participating dealer for details. %Off Offer includes price reduction below MSRP and Cash Allowance. On Select 2019 Chevrolet Vehicles. Not available with special finance, lease or other offers. Take new retail delivery by 04/30/19. GMF Down Payment Assistance. Cash usable only if financed through a supported or unsupported GMF contract. NOT Compatible with Standalone APR Program. Customer must qualify and finance with GM Financial. See participating dealer for details. $2,797 off MSRP! Priced below KBB Fair Purchase Price! This 2019 Chevrolet Sonic LT in Mosaic Black Metallic is well equipped with: 1.4L 4-Cylinder Turbocharged, 2 USB Ports & Auxiliary Input Jack, Emergency communication system, Exterior Parking Camera Rear, SiriusXM Radio. 26/34 City/Highway MPG Included 2 Year Complimentary Basic Maintenance / In Business Over 90 years / Call 1-888-844-3454 For Details. %Off Offer includes price reduction below MSRP and Cash Allowance. On Select 2019 Chevrolet Vehicles. Not available with special finance, lease or other offers. Take new retail delivery by 04/30/19. GMF Down Payment Assistance. Cash usable only if financed through a supported or unsupported GMF contract. NOT Compatible with Standalone APR Program. Customer must qualify and finance with GM Financial. See participating dealer for details. $2,797 off MSRP! Priced below KBB Fair Purchase Price! This 2019 Chevrolet Sonic LT in Summit White is well equipped with: 1.4L 4-Cylinder Turbocharged, 15" Aluminum Wheels, 2 USB Ports & Auxiliary Input Jack, Emergency communication system, Exterior Parking Camera Rear, Heated door mirrors, SiriusXM Radio, Speed control. 26/34 City/Highway MPG Included 2 Year Complimentary Basic Maintenance / In Business Over 90 years / Call 1-888-844-3454 For Details. %Off Offer includes price reduction below MSRP and Cash Allowance. On Select 2019 Chevrolet Vehicles. Not available with special finance, lease or other offers. Take new retail delivery by 04/30/19. GMF Down Payment Assistance. Cash usable only if financed through a supported or unsupported GMF contract. NOT Compatible with Standalone APR Program. Customer must qualify and finance with GM Financial. See participating dealer for details. $2,797 off MSRP! Priced below KBB Fair Purchase Price! This 2019 Chevrolet Sonic LT in Summit White is well equipped with: 1.4L 4-Cylinder Turbocharged, 15" Aluminum Wheels, 2 USB Ports & Auxiliary Input Jack, Emergency communication system, Exterior Parking Camera Rear, Heated door mirrors, SiriusXM Radio. 26/34 City/Highway MPG Included 2 Year Complimentary Basic Maintenance / In Business Over 90 years / Call 1-888-844-3454 For Details. %Off Offer includes price reduction below MSRP and Cash Allowance. On Select 2019 Chevrolet Vehicles. Not available with special finance, lease or other offers. Take new retail delivery by 04/30/19. GMF Down Payment Assistance. Cash usable only if financed through a supported or unsupported GMF contract. NOT Compatible with Standalone APR Program. Customer must qualify and finance with GM Financial. See participating dealer for details. $3,550 off MSRP! Priced below KBB Fair Purchase Price! This 2019 Chevrolet Cruze LS in Silver Ice Metallic is well equipped with: 1.4L 4-Cylinder Turbo DOHC CVVT, 2 Front USB Ports, Emergency communication system: OnStar and Chevrolet connected services capable, Exterior Parking Camera Rear, Radio: Chevrolet Infotainment 3 System. 28/38 City/Highway MPG Included 2 Year Complimentary Basic Maintenance / In Business Over 90 years / Call 1-888-844-3454 For Details. %Off Offer includes price reduction below MSRP and Cash Allowance. On Select 2019 Chevrolet Vehicles. Not available with special finance, lease or other offers. Take new retail delivery by 04/30/19. GMF Down Payment Assistance. Cash usable only if financed through a supported or unsupported GMF contract. NOT Compatible with Standalone APR Program. Customer must qualify and finance with GM Financial. See participating dealer for details. %Off Offer includes price reduction below MSRP and Cash Allowance. On Select 2019 Chevrolet Vehicles. Not available with special finance, lease or other offers. Take new retail delivery by 04/30/19. GMF Down Payment Assistance. Cash usable only if financed through a supported or unsupported GMF contract. NOT Compatible with Standalone APR Program. Customer must qualify and finance with GM Financial. See participating dealer for details. $3,550 off MSRP! Priced below KBB Fair Purchase Price! This 2019 Chevrolet Cruze LS in Silver Ice Metallic is well equipped with: 1.4L 4-Cylinder Turbo DOHC CVVT, 2 Front USB Ports, Emergency communication system: OnStar and Chevrolet connected services capable, Exterior Parking Camera Rear. 28/38 City/Highway MPG Included 2 Year Complimentary Basic Maintenance / In Business Over 90 years / Call 1-888-844-3454 For Details. %Off Offer includes price reduction below MSRP and Cash Allowance. On Select 2019 Chevrolet Vehicles. Not available with special finance, lease or other offers. Take new retail delivery by 04/30/19. GMF Down Payment Assistance. Cash usable only if financed through a supported or unsupported GMF contract. NOT Compatible with Standalone APR Program. Customer must qualify and finance with GM Financial. See participating dealer for details. %Off Offer includes price reduction below MSRP and Cash Allowance. On Select 2019 Chevrolet Vehicles. Not available with special finance, lease or other offers. Take new retail delivery by 04/30/19. GMF Down Payment Assistance. Cash usable only if financed through a supported or unsupported GMF contract. NOT Compatible with Standalone APR Program. Customer must qualify and finance with GM Financial. See participating dealer for details. $3,550 off MSRP! Priced below KBB Fair Purchase Price! This 2019 Chevrolet Cruze LS in Black Metallic is well equipped with: 1.4L 4-Cylinder Turbo DOHC CVVT, 2 Front USB Ports, Emergency communication system: OnStar and Chevrolet connected services capable, Exterior Parking Camera Rear. 28/38 City/Highway MPG Included 2 Year Complimentary Basic Maintenance / In Business Over 90 years / Call 1-888-844-3454 For Details. %Off Offer includes price reduction below MSRP and Cash Allowance. On Select 2019 Chevrolet Vehicles. Not available with special finance, lease or other offers. Take new retail delivery by 04/30/19. GMF Down Payment Assistance. Cash usable only if financed through a supported or unsupported GMF contract. NOT Compatible with Standalone APR Program. Customer must qualify and finance with GM Financial. See participating dealer for details. %Off Offer includes price reduction below MSRP and Cash Allowance. On Select 2019 Chevrolet Vehicles. Not available with special finance, lease or other offers. Take new retail delivery by 04/30/19. GMF Down Payment Assistance. Cash usable only if financed through a supported or unsupported GMF contract. NOT Compatible with Standalone APR Program. Customer must qualify and finance with GM Financial. See participating dealer for details. $3,550 off MSRP! Priced below KBB Fair Purchase Price! This 2019 Chevrolet Cruze LS in Black Metallic is well equipped with: 1.4L 4-Cylinder Turbo DOHC CVVT, 2 Front USB Ports, Emergency communication system: OnStar and Chevrolet connected services capable, Exterior Parking Camera Rear, Radio: Chevrolet Infotainment 3 System. 28/38 City/Highway MPG Included 2 Year Complimentary Basic Maintenance / In Business Over 90 years / Call 1-888-844-3454 For Details. %Off Offer includes price reduction below MSRP and Cash Allowance. On Select 2019 Chevrolet Vehicles. Not available with special finance, lease or other offers. Take new retail delivery by 04/30/19. GMF Down Payment Assistance. Cash usable only if financed through a supported or unsupported GMF contract. NOT Compatible with Standalone APR Program. Customer must qualify and finance with GM Financial. See participating dealer for details. %Off Offer includes price reduction below MSRP and Cash Allowance. On Select 2019 Chevrolet Vehicles. Not available with special finance, lease or other offers. Take new retail delivery by 04/30/19. GMF Down Payment Assistance. Cash usable only if financed through a supported or unsupported GMF contract. NOT Compatible with Standalone APR Program. Customer must qualify and finance with GM Financial. See participating dealer for details. $3,550 off MSRP! Priced below KBB Fair Purchase Price! This 2019 Chevrolet Cruze LS in Summit White is well equipped with: 1.4L 4-Cylinder Turbo DOHC CVVT, 2 Front USB Ports, Emergency communication system: OnStar and Chevrolet connected services capable, Exterior Parking Camera Rear, Radio: Chevrolet Infotainment 3 System. 28/38 City/Highway MPG Included 2 Year Complimentary Basic Maintenance / In Business Over 90 years / Call 1-888-844-3454 For Details. %Off Offer includes price reduction below MSRP and Cash Allowance. On Select 2019 Chevrolet Vehicles. Not available with special finance, lease or other offers. Take new retail delivery by 04/30/19. GMF Down Payment Assistance. Cash usable only if financed through a supported or unsupported GMF contract. NOT Compatible with Standalone APR Program. Customer must qualify and finance with GM Financial. See participating dealer for details. %Off Offer includes price reduction below MSRP and Cash Allowance. On Select 2019 Chevrolet Vehicles. Not available with special finance, lease or other offers. Take new retail delivery by 04/30/19. GMF Down Payment Assistance. Cash usable only if financed through a supported or unsupported GMF contract. NOT Compatible with Standalone APR Program. Customer must qualify and finance with GM Financial. See participating dealer for details. $2,869 off MSRP! Priced below KBB Fair Purchase Price! This 2019 Chevrolet Sonic LT in Cajun Red Tintcoat is well equipped with: 1.4L 4-Cylinder Turbocharged, 15" Aluminum Wheels, Emergency communication system, Exterior Parking Camera Rear, Heated door mirrors, SiriusXM Radio, Speed control. 26/34 City/Highway MPG Included 2 Year Complimentary Basic Maintenance / In Business Over 90 years / Call 1-888-844-3454 For Details. %Off Offer includes price reduction below MSRP and Cash Allowance. On Select 2019 Chevrolet Vehicles. Not available with special finance, lease or other offers. Take new retail delivery by 04/30/19. GMF Down Payment Assistance. Cash usable only if financed through a supported or unsupported GMF contract. NOT Compatible with Standalone APR Program. Customer must qualify and finance with GM Financial. See participating dealer for details. $3,622 off MSRP! Priced below KBB Fair Purchase Price! This 2019 Chevrolet Cruze LS in Silver Ice Metallic is well equipped with: 1.4L 4-Cylinder Turbo DOHC CVVT, 2 Front USB Ports, Exterior Parking Camera Rear, Radio: Chevrolet Infotainment 3 System. 28/38 City/Highway MPG Included 2 Year Complimentary Basic Maintenance / In Business Over 90 years / Call 1-888-844-3454 For Details. %Off Offer includes price reduction below MSRP and Cash Allowance. On Select 2019 Chevrolet Vehicles. Not available with special finance, lease or other offers. Take new retail delivery by 04/30/19. GMF Down Payment Assistance. Cash usable only if financed through a supported or unsupported GMF contract. NOT Compatible with Standalone APR Program. Customer must qualify and finance with GM Financial. See participating dealer for details. %Off Offer includes price reduction below MSRP and Cash Allowance. On Select 2019 Chevrolet Vehicles. Not available with special finance, lease or other offers. Take new retail delivery by 04/30/19. GMF Down Payment Assistance. Cash usable only if financed through a supported or unsupported GMF contract. NOT Compatible with Standalone APR Program. Customer must qualify and finance with GM Financial. See participating dealer for details. $3,592 off MSRP! Priced below KBB Fair Purchase Price! This 2019 Chevrolet Cruze LS in Red Hot is well equipped with: 1.4L 4-Cylinder Turbo DOHC CVVT, 2 Front USB Ports, Emergency communication system: OnStar and Chevrolet connected services capable, Exterior Parking Camera Rear, Radio: Chevrolet Infotainment 3 System. 28/38 City/Highway MPG Included 2 Year Complimentary Basic Maintenance / In Business Over 90 years / Call 1-888-844-3454 For Details. %Off Offer includes price reduction below MSRP and Cash Allowance. On Select 2019 Chevrolet Vehicles. Not available with special finance, lease or other offers. Take new retail delivery by 04/30/19. GMF Down Payment Assistance. Cash usable only if financed through a supported or unsupported GMF contract. NOT Compatible with Standalone APR Program. Customer must qualify and finance with GM Financial. See participating dealer for details. %Off Offer includes price reduction below MSRP and Cash Allowance. On Select 2019 Chevrolet Vehicles. Not available with special finance, lease or other offers. Take new retail delivery by 04/30/19. GMF Down Payment Assistance. Cash usable only if financed through a supported or unsupported GMF contract. NOT Compatible with Standalone APR Program. Customer must qualify and finance with GM Financial. See participating dealer for details. $3,582 off MSRP! Priced below KBB Fair Purchase Price! This 2019 Chevrolet Cruze LS in Summit White is well equipped with: 1.4L 4-Cylinder Turbo DOHC CVVT, 2 Front USB Ports, Emergency communication system: OnStar and Chevrolet connected services capable, Exterior Parking Camera Rear, Radio: Chevrolet Infotainment 3 System. 28/38 City/Highway MPG Included 2 Year Complimentary Basic Maintenance / In Business Over 90 years / Call 1-888-844-3454 For Details. %Off Offer includes price reduction below MSRP and Cash Allowance. On Select 2019 Chevrolet Vehicles. Not available with special finance, lease or other offers. Take new retail delivery by 04/30/19. GMF Down Payment Assistance. Cash usable only if financed through a supported or unsupported GMF contract. NOT Compatible with Standalone APR Program. Customer must qualify and finance with GM Financial. See participating dealer for details. %Off Offer includes price reduction below MSRP and Cash Allowance. On Select 2019 Chevrolet Vehicles. Not available with special finance, lease or other offers. Take new retail delivery by 04/30/19. GMF Down Payment Assistance. Cash usable only if financed through a supported or unsupported GMF contract. NOT Compatible with Standalone APR Program. Customer must qualify and finance with GM Financial. See participating dealer for details. Based on 2017 EPA mileage ratings. Use for comparison purposes only. Your actual mileage will vary depending on how you drive and maintain your vehicle. Disclaimer: While every effort has been made to ensure that the information included on this site is accurate, neither Chevrolet nor the dealer can guarantee that the inventory shown will be available at the dealership. All inventory listed is subject to prior sale. Manufacturer incentives and Cox Chevrolet Savings and Allowances may expire at any time. Prices are valid on day of publication only. Offers cannot be combined. Internet prices already include all applicable manufacturer rebates and incentives (in lieu of the GM special finance rate) which are subject to manufacturer incentive or rebate qualification criteria and requirements, and which may be contingent upon manufacturer finance company approval. Price is valid when it originates from an internet advertisement and the customer must present the advertisement. New Car Internet prices include all applicable factory incentives in lieu of special interest rate (offers can not be combined). Dealer service/document fee of $799.00, electronic fee of $139.00, Tax, tag/registration fee and any finance charges are not included on quoted price. Used Vehicle Internet Discounted price includes $1,000 Trade Assistance Allowance. Qualifying trade must be a 1999 model or newer with less than 100,000 miles on the odometer. Internet price subject to change without notice to correct errors or omissions or in the event of inventory fluctuations. Manufacturer incentives may expire at any time. MSRP is provided by the manufacturer for informational purposes only. Accessories and color may vary. Standard features are based upon trim level. Price does not include dealer installed options or equipment. All features are not available for all vehicles. Please contact the store by email or phone for more details and availability of factory incentives. Neither dealer nor its affiliates will be responsible for typographical or other errors, including data transmission, display, or software errors that may appear on the site. EPA estimates only. The features and options listed may not apply to this specific vehicle. Tax, title, license (unless itemized above) are extra. Not available with special finance, lease and some other offers. See and/or Contact dealer for complete details. This is easily done by calling us at (941) 749-2690 or by visiting us at the dealership. Why Choose a New Chevrolet from Cox Chevrolet?